Are you looking for a Clash of Clans Tier 7 or Tier 8 account? Want to jump right into Clan Wars without having to grind through lower tier bases? Acckings has some of the best CoC accounts at the most competitive rates in the market! For a reasonable price you can buy a Clash of Clans account and be raiding with you dragons the same day. 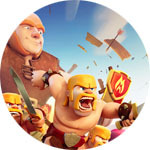 Acckings is always looking to add new Clash of Clans accounts to our stock and we aim to provide a vast variety of accounts for our customers to choose from. We accept a handful of payment methods through G2Apay and Paypal, designed to make buying a CoC account as simple and streamlined as possible. Our Support Team is available 24/7 via our Support Hub. If should you ever encounter any issues while buying CoC accounts through Acckings, do not hesitate to contact us! We take pride in keeping our customers happy and without issue. Acckings has a comprehensive verification process designed to secure our Clash of Clans accounts before they are sold, in order to make them the safest accounts for our customers to play on. Here at Acckings, we do buy Clash of Clans accounts from our verified sellers but we also create CoC accounts in house. When viewing a Clash of Clans account that you are interested in purchasing, be sure to take note of the icons in the accounts description. You will be able to tell whether the account has been created in-house or if it’s been purchased from a 3rd party by examining the icons. Here at Acckings, we believe it is our duty to provide you safe CoC accounts to play on at an affordable price. If you ever have any issues with the Clash of Clans account you have purchased, please contact our 24/7 Support Team via the Support Hub. Acckings offers an "Insurance" Program, built to assure our customers peace of mind with their account purchase. Every time you buy a CoC account from us, Acckings aims to protect our customers fully. Each account we sell has added insurance offered on it for 10% of its sell-price, which is added to the total price. With Acckings Insurance Program, you will receive our Account Lifetime Guarantee. If the Clash of Clans account you purchased is ever recovered, you will receive a 100% refund in site credit. The Insurance Program never expires, and the site credit can be used to purchase other accounts up to equal value. You can read more about our Clash of Clans accounts Insurance Program here.